Today I'm going to share a tip that has the power to literally transform mealtimes with little ones. In our house, at each meal, I have three plates worth of food to cut up. One plate requires small, "non-chokable" bites for Grace. Another requires medium-sized 4-year-old bites for Josh. And then there's a plate of regular-sized bites for Jilly. Y'all -- that's a lot of cutting. It's rather tedious and, if you happen to be eating something like pizza, the cutting can get a little messy. Many of you probably already have a pair in your kitchen utensil drawer, but, if you're like me, you had no idea what to do with them. With the kitchen shears, I can cut up three kiddie dinners in about 1/3 of the time with the precision of a samurai chef. Seriously -- it's such a time saver. And for pizza? It's golden. You actually manage to keep the cheese on the crust, instead of tearing all the cheese off the pieces you try to cut with a fork and knife. I've also been known to tuck my shears into the diaper bag for birthday parties and the like, because the only thing worse than cutting food into small bites with a fork and knife is having to do it with a plastic fork and knife. 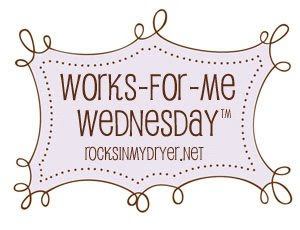 For more great ideas and tips, head on over to Works for Me Wednesday! And -- it's the last day to enter the book and beauty makeover at Chic Critique. Be sure to check it out! That is a great idea! I will have to get a second set because the set I have is used to open everything. Awesome idea! I have a pair of kitchen shears like that and I love them. I just read that comment about using them to prep veggies for salad...BRILLIANT! I learn so much from other bloggers. Ya'll are so inspiring. My kids are the exact same ages as yours, so I can totally relate to how long it takes to cut up their food! I am not picky about much, but I do like to eat my food hot and often by the time I get theirs all cut up mine is cold. I will have to try the kitchen shears. I find it easier with my shears than a knife. I love this idea! 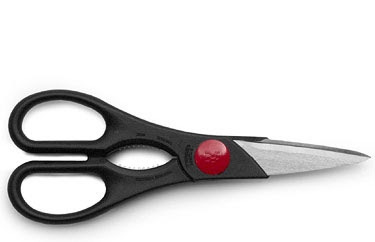 The shears can also be used at birthday parties to free trapped toys from their original entrapment(some FDA-required, screwdriver needed, concoction) or to threaten children. I mean, either or..